The pathway to Birgit's front door meanders through her award-winning garden. The mature plantings offer a bounty of shapes, colours and textures. 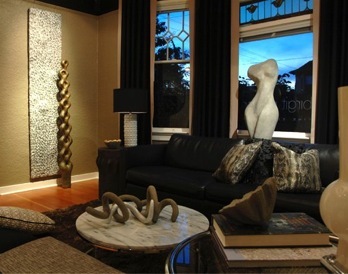 Mixed-media concrete sculptures, hand-built by the artist, accent special places. Birgit’s garden was featured in Britain’s prestigious Gardens Illustrated magazine in 2012. 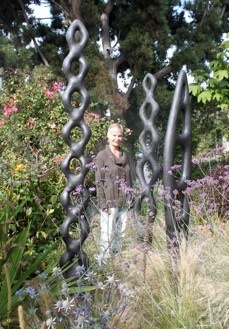 Renowned photographer Claire Takacs visited Birgit’s garden in 2011. Steve Whysall, garden columnist for the Vancouver Sun, supplied the text for Takacs photos. Birgit became acquainted with the medium of concrete while constructing the garden’s walkways. “In 2005, I wanted to add a new dimension to the garden,” she says. Her first major piece, a curvaceous female form remains on guard in the side garden. 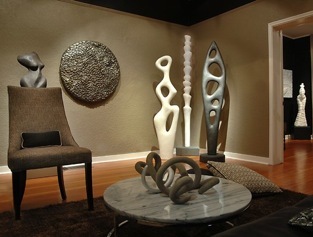 Over the years, the hard working artist has successfully sculpted concrete into a variety of forms: gigantic voluptuous petals, twisting corkscrew forms, elongated figures mysteriously wrapped, textured panels, and containers of all shapes and sizes. “I am inspired by lines and forms I see in art, architecture and nature,” she says. Sculpting concrete is a laborious process which totally engages the artist. For her, working with a liquid that becomes a solid embodies the concept of transformation. “On all levels, life is constantly changing,” she says, “and I honour this process in my work.” Birgit utilizes her science background when mixing concrete formulas. She applies the concrete compound to a steel armature, building up layers by modelling. After curing, the surfaces are enlivened with various pigments, acidic washes and metallic leaf. Birgit’s statuary invites comparisons to Constantin Brancusi (1876-1957), well known in Paris in the 1920‘s. She appreciates the modernist, meditative sculpture of Barbara Hepworth, and the organic shapes of Henry Moore. 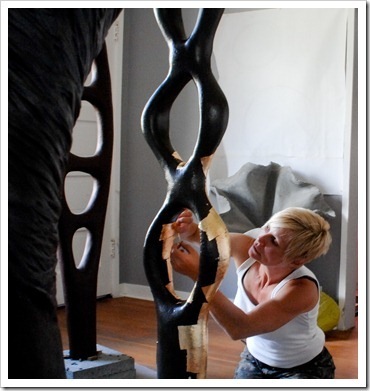 With hard work and dedication, Birgit anticipates international sales for her sculptures. After meeting this talented and charismatic woman, it’s easy to envision her success. 570 Niagara Street in Victoria. Phone: 250 858-4334 for Appointment. For ten years she operated an art & framing store.